From April 5-9 2018, LGBT Women and Allies gathered in Las Vegas, Nevada, to celebrate positive LGBT female representation in the media. Our editor, Christine, attended the convention as well as countless others and this is her experiences. 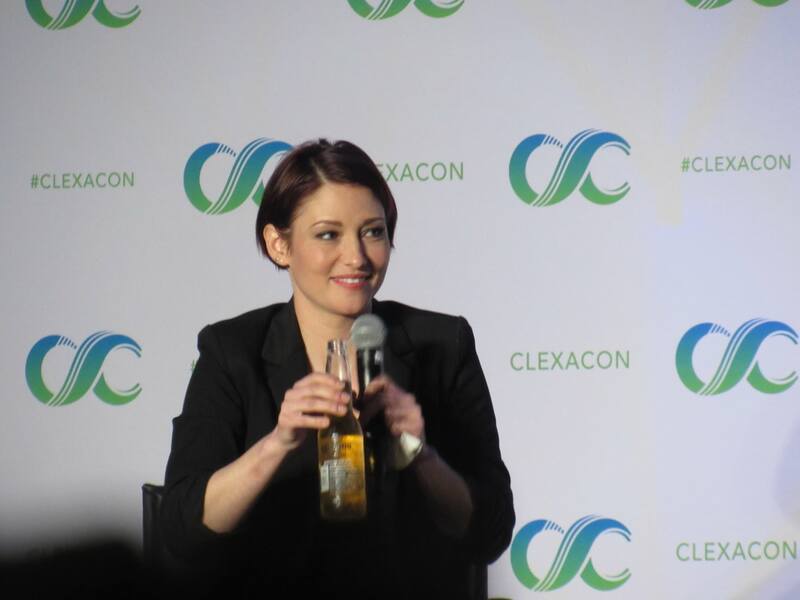 For me, I wasn’t initially going to attend ClexaCon, I was going to attend another Con later in the year, but my friends swayed my decision and convinced me to buy my tickets. Fast forward three months and my tickets, flight, and the hotel was all booked and I was waiting in the bar at Terminal 3 of Toronto Pearson writing a TV recap for my flight to leave for Las Vegas. I have never been happier that I allowed myself to be influenced by my friends as this weekend was truly life changing for me! In the lead up to ClexaCon, I imagined what it would be like, but never in my wildest dreams did I imagine that it would be as amazing as it was in reality! 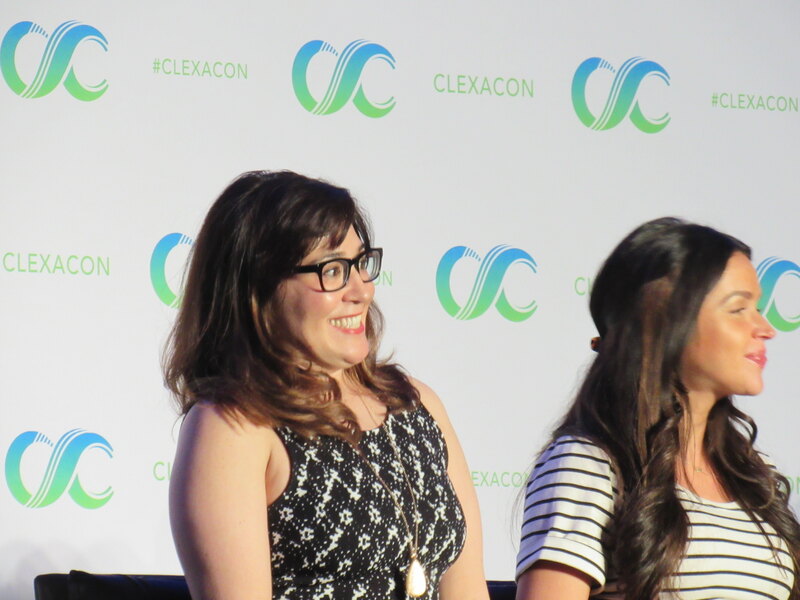 I have been to a few other Cons, FanExpo in Toronto and BufferFest in Toronto, and I had never been to a Con which encompassed my Fandoms quite as much as ClexaCon did. Also, those other Cons did not give me the opportunity to FanGirl about the Fangirls, but I’ll get to that later. The first ‘day’ I was there, my flights landed after a few short delays, and I had reached the hotel. I wasn’t staying at the same hotel that the Convention was at, but it turns out that was a sort of blessing in disguise – not that I am going to do that next year. I was staying with some friends that I made from The Carmilla Movie screening in Toronto six months prior, and we met up with the other member of our group chat – affectionately called The Pickle Group named after the Pickle that Natasha Negovanlis painted in Graffiti Alley in Kensington Market, Toronto – and we went for dinner to catch up and to meet some other fans who were attending the convention. 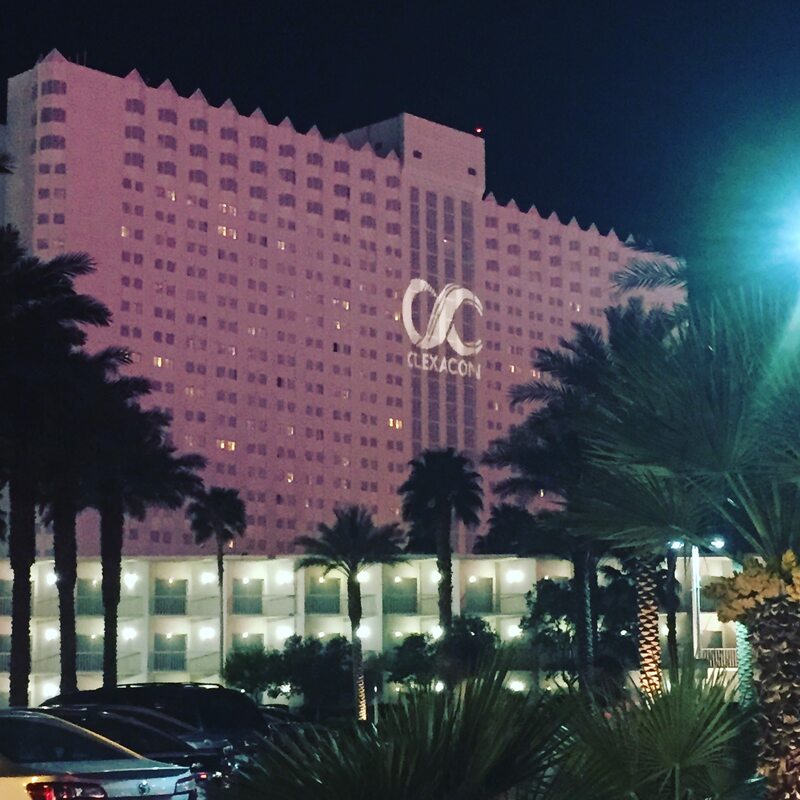 We stumbled across the amazing sight of the ClexaCon symbol projected on the side of The Tropicana – the hotel which hosted the convention – and it drew us in like a homing beacon. I stayed out probably a little longer than was wise, but what is a convention if you don’t run on four hours of sleep each day? My Caption on Instagram: Gotta go my people need me! The bat signal is up! The first day of the convention itself was INSANE! A 7am wake-up call was in order to wait in line for a few hours to get in to buy a photo op ticket and get a Limited Edition Lora Innes Wynonna Earp print (of which I managed to snag both thanks to one of my friends), and then it was time to wait in line for panels after some shopping in Artists Alley (by some shopping I mean buying a lot of artwork, pins, and jewellery to wear around for the whole con and have not left me since). The first panel for me was the LGBTQ Actresses panel and then it was on to the Lost Girl Reunion panel where Brunch was born. Who would have thought that Brunch would no longer mean to us what it means to the rest of the world thanks Anna Silk and Zoie Palmer for that one, I can no longer hear or see the word without bursting into a fit of laughter and I have even banned people from saying it in work. Right after this one I went and lined up for two hours to get into the Wynonna Earp panel. (If you haven’t guessed from articles I have written where I sneak in references wherever I can, I ADORE Wynonna Earp and there was no way I was missing this panel!) 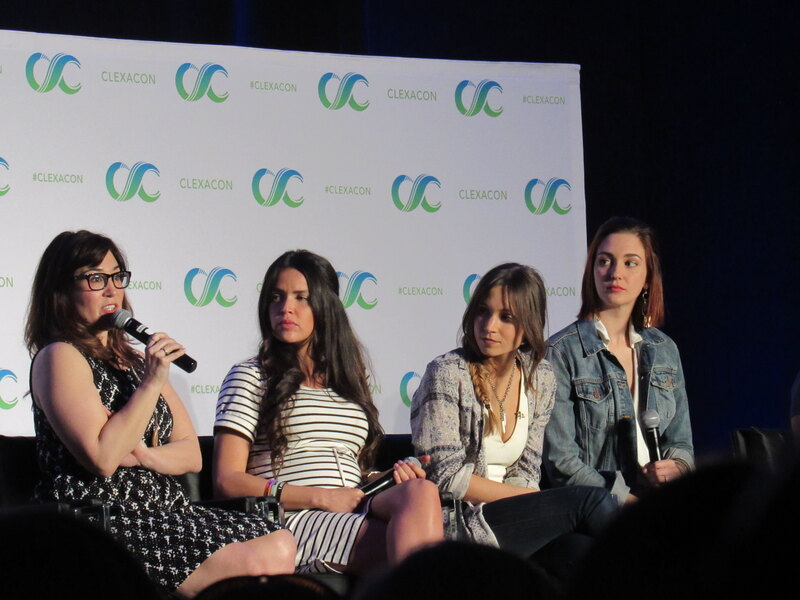 There was so much going on in this panel and I managed to get a seat in the VIP section to get some good pictures. After Wynonna Earp, the main panels were done for the night and it was time to go off for pizza and Beer Pong with the Canadian Earpers, where we totally destroyed the straight men (just saying that’s a highlight of the trip for me but then the whole trip is unforgettable). This has become my most treasured possession! It is now the background on my phone and laptop, I have a copy on my desk in work and I am definitely making this into my Christmas card every year until I die! After my photo op, it was time to line up again to be in and out of panels all day. We started out with WayHaught (the ship name for Waverly Earp and Nicole Haught from Wynonna Earp), then I moved on to Black Lightning, Behind the Badge: Alex Danvers, and then Hollstein. Every single panel was AMAZING! 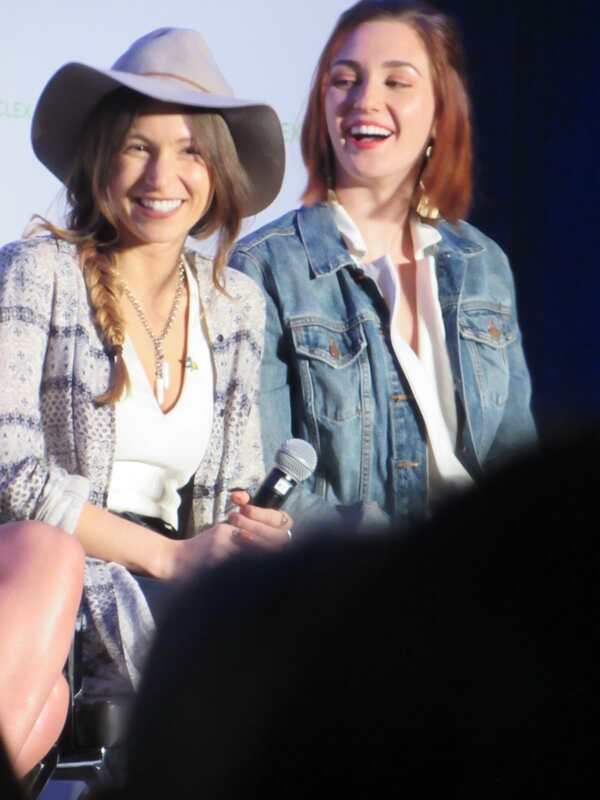 From being in a jam-packed room with standing space only for WayHaught, (seriously though how much do we all LOVE Dom and Kat?) to Black Lightning where we discussed the impact of the ‘First Black Bulletproof Lesbian’, to Chyler Leigh singing ‘Red Robin’ and making us all cry at every turn, to the laughter and comedy of the Hollstein Panel where movie scenes were reenacted in front of us, the day was full of love and laughter. The night was easily just as busy. I was offered a ticket to the Afterparty by a friend, and I am so happy I said yes to it. I got to be at a dance party with Stephanie Beatriz (Rosa Diaz from Brooklyn 99), Isabella Gomez (Elena from One Day at a Time) and Sharon Belle ( Danny Lawrence from Carmilla and Elise in Swerve). How can a night out ever compare to that! Again I stayed out maybe a little too late and drank a little too much but Hey! When in Vegas! Day 3 was lighter for me. 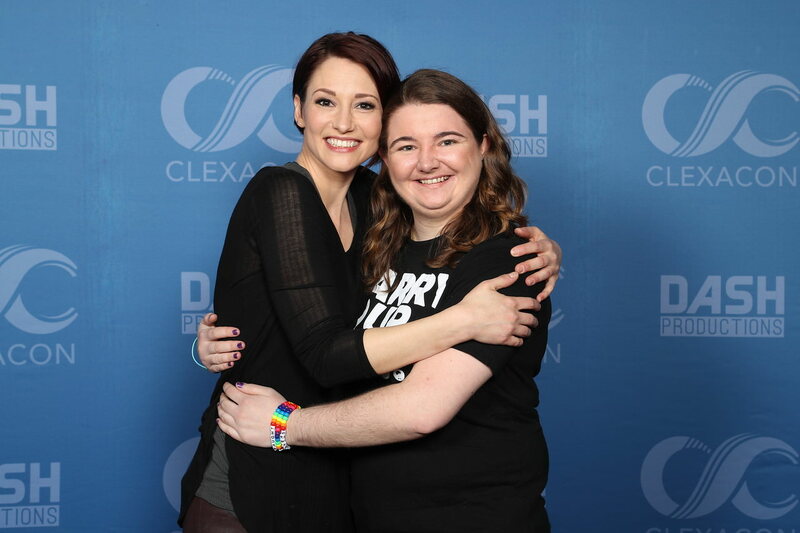 I got up as early as I could and waited in line to get an autograph from Chyler Leigh (I did say it was a goal of mine for the Con didn’t I?) and ended up missing a panel that I really wanted to see but priorities! Am I right? (I really wanted to go to the Legends of Tomorrow panel with Caity Lotz and Maisie Richardson-Sellers but the line for autographs was HUGE and I didn’t get out of there until a quarter way through the panel at 12:30). After that, I had my Meet and Greet with Natasha Negovanlis (Carmilla Karnstein of Carmilla). This entire day up until then I can say that I was the living embodiment of anxiety. Meeting Chyler Leigh and Natasha Negovanlis on the same day was a LOT! I got to spend 30 minutes in the same room as her and we spoke about all things KindaTV and Clairevoyant, and it was amazing to get to know her a little better. After the Meet and Greet, I could have gone to the SHETHORITY Panel, but I knew the line up would be insane and that I would be hard pushed to make the next panel I wanted to go to, so I made another sacrifice, this time I finished off my shopping in Artists Alley and went to the Wynonna Earp Fans Panel which was being held right when the SHETHORITY Panel was finishing. 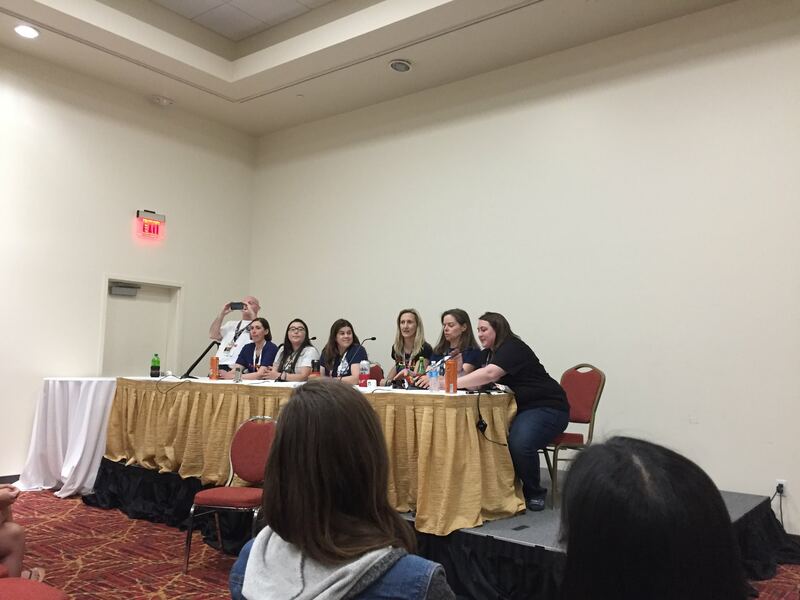 After this one, it was time to jump into the Live Tales of the Black Badge Podcast recording (a Wynonna Earp Podcast) to finish out the final panel of the final day of ClexaCon. We had a quick photo call for the Patreon Supporters (of which I am one) and then I went off to play Cards Against Purgatory outside in the sun before dinner and a walk along the Strip. We didn’t want the night to end so we kind of gatecrashed on some Earpers who were drinking in the lounge area for the second time that weekend (SORRY NOT SORRY because I got to meet some people that I admire from Twitter) and then went gambling. After gambling until 2am, it was time for me to pack to leave for the airport at 6am and leave Las Vegas until ClexaCon 2019. As I write this, it has been four weeks since I flew out for that first night in Las Vegas and found the Bat signal and I’ve still not fully processed my thoughts or feelings from this convention. This one was life changing, and I do not say that lightly. Being around so many amazing people who shared the same passions is never something I will get over, and being around so many other LGBT+ Women and Allies in the same room is, for lack of a better word, awe inspiring if that’s even the right word to use here. The moment I left the Tropicana, where the convention was being held, I instantly felt the Con Depression. I wasn’t even on the flight yet or was packed, but I just knew that it was all over. I didn’t want the weekend to end, because then that meant that I didn’t get to spend every single day with my friends. It meant that I didn’t get to spend my time going to amazing panels featuring the people that I look up to. It meant that I had to go back to my non-fangirl life and work a full time job again instead of lining up outside of panels on four hours of sleep. 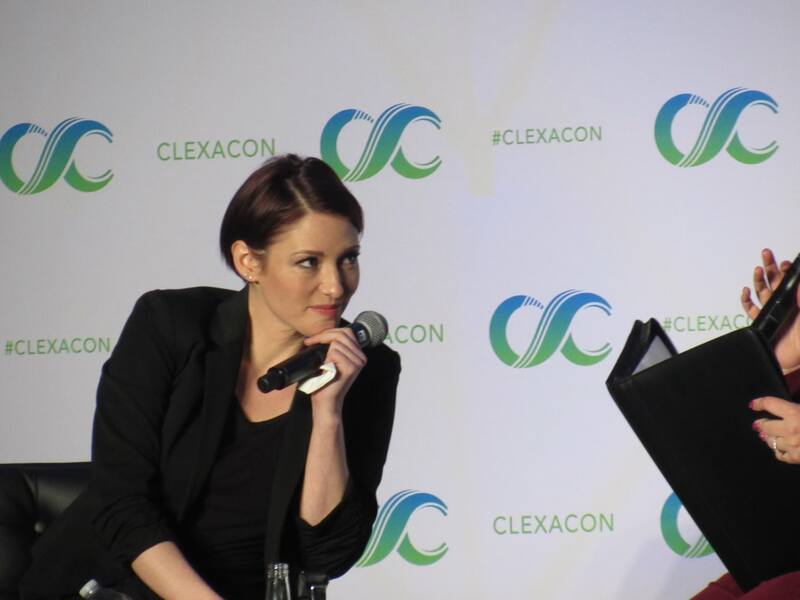 At least when this convention finished, I already had another one to look forward to (EHCon Canada) and the dates for ClexaCon2019 have been released so now I can finally start saving for that one too, but it is still to far away for both of them ( If only we could have conventions every weekend which were free to go to). The post-con depression is real, but I loved EVERY single second of ClexaCon and being surrounded by compassionate and caring like minded people for that one weekend of the year makes me feel spoiled. Every single Con I go to is different, and this one is no exception. This Con makes you feel loved and accepted by every single person who is there and this is the lesson that I will carry on through to my every day life. All pictures here are the property of our editor and writer of this post, Christine.